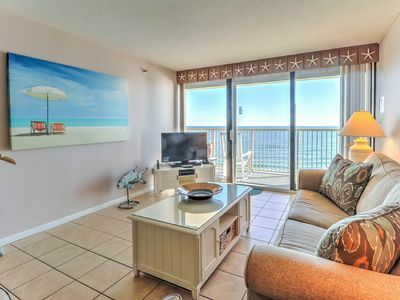 Luxury Oceanview Condo - Just Steps From Everything! 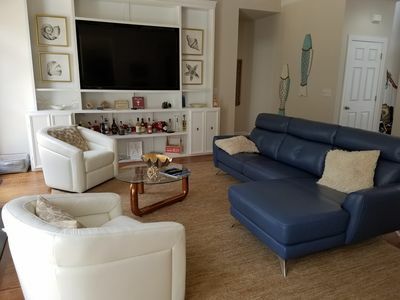 Rare ocean/lake view luxury condominium. 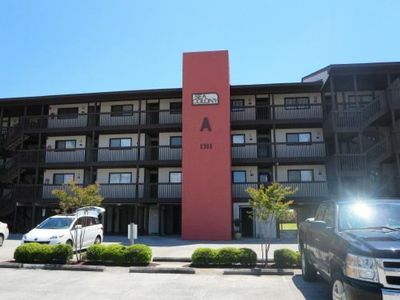 Very spacious and comfortable at almost 2000 sq feet. Upscale throughout. Sleeps 10. The top floor as a king master bedroom with a large flat screen tv, lake view balcony, and a private master bath, half bath, gourmet kitchen, granite counter tops, stainless steel appliances, wine/coffee bar, dining/living room, large flat screen tv, beautiful furnishings with custom lighting, and a ocean view balcony. 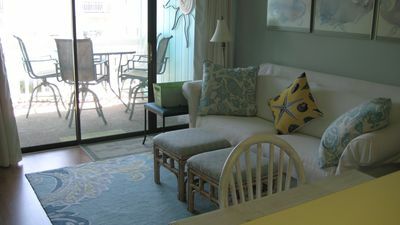 The lower floor has 2 tastefully decorated queen bedrooms and 1 bedroom with 2 twin beds. 2 full baths are located on this level as well. 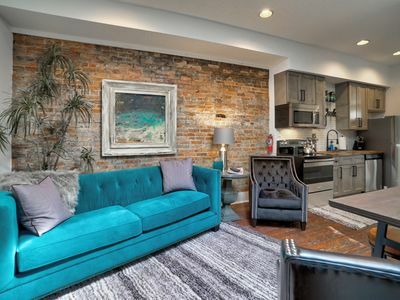 2 of the 3 bedrooms have flat screen tvs. There is a lake view balcony off the rear bedroom. Separate heating and cooling zones. Private garage. Professionally provided linens and towels will be set up if requested. 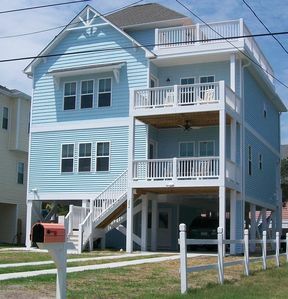 (Fees apply) Located on a semi private street across from the ocean. 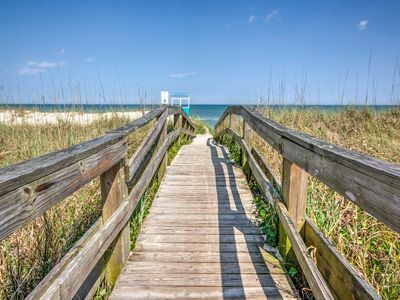 Just a few steps to the beach access. Take a short stroll to the boardwalk and enjoy the thrill rides, listen to live music at the pavilion, grab a slice of Frank's pizza, have a Britt's donut (rated #2 donut shop in the nation), chocolate-covered strawberries from the Fudgeboat, and watch the fireworks at dark. Highly rated restaurants preparing some of the finest seafood on the east coast are just minutes away. 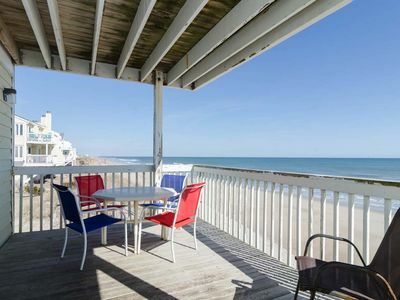 Or just stay in and view the fireworks from your ocean-side balcony. 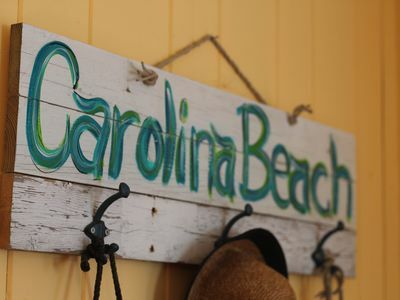 If being on the beach all day isn't enough, walk across the street to the lake and rent a paddle boat, let the kid's play on the playground, or sit at one of the gazebos located on the water. Take a ride down to Ft. Fisher and walk through the civil war museum (look for info on the Ft. Fisher Hermit) or go to the NC Aquarium at Ft. Fisher. The live oaks at Ft. Fisher is a perfect back drop for photos. Or go sea shell collecting here. Water sports are in abundance nearby with charter fishing, jet ski rental, surfing lessons, and sea kayaking. Two challenging golf courses are less than 10 minutes away. 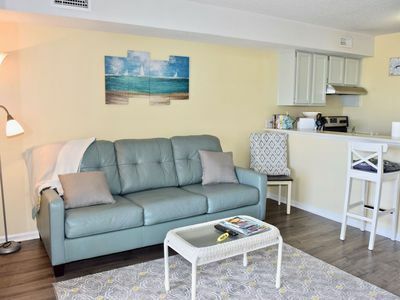 Whether it is sunbathing on the beach, renting scooters or a golf cart and sight seeing, or watching a free outdoor movie on Sunday nights at the Lake (located just across the road), there is lots to do on Pleasure Island and this condo is right in the middle of it all. 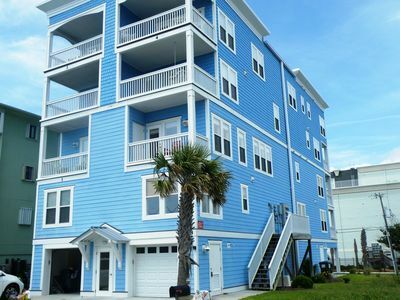 Oceanfront Condo with Great Views by Boardwalk! Pool-Hi Speed Wifi-Linen! 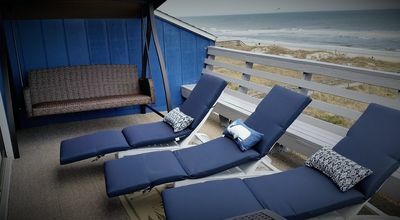 A Summers Rest - The only Ocean Front, Private Volleyball Court! Great location! 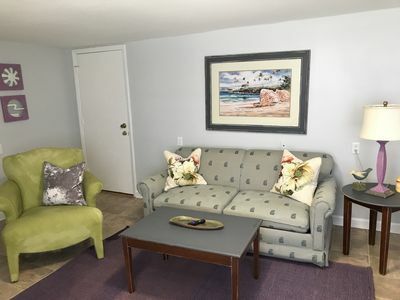 **** 5 Star Oceanside Cottage - Pet Friendly, FREE WIFI with a yard! Come SEA Our Difference... 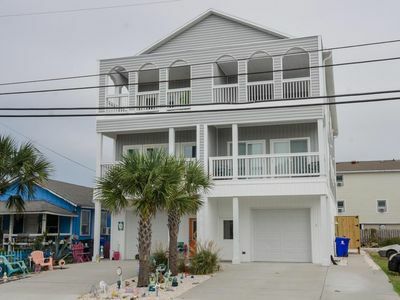 Stunning Large Single Family Home in the Luxurious Sea Watch Community at the Beach! 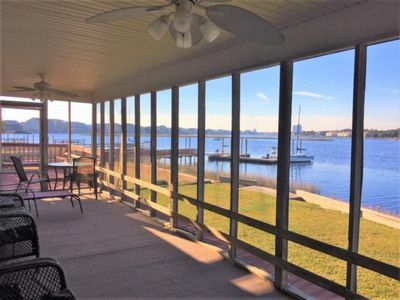 Come Sea Our Difference...4 Bedroom/2 Bath, Private Boat Ramp, Boat Slip and Dock right at your back door! CLEAN/BRIGHT STEPS TO THE BEACH. 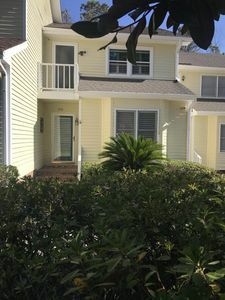 2 POOLS THE CONDO SURVIVED HURRICANE FLORENCE! 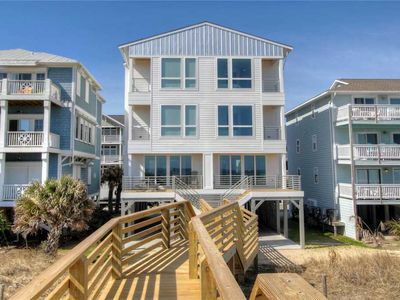 Oceanfront. 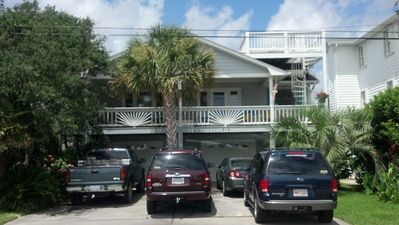 Huge Deck, Covered Parking, Elevator, Oceanfront Pool, FREE WIFI. 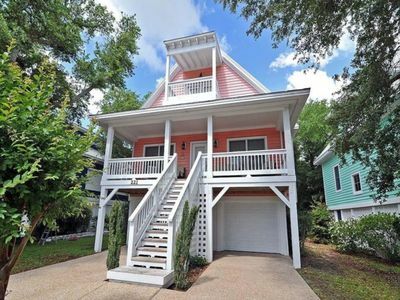 Coastal Home with room for your whole family! 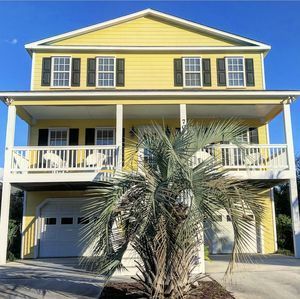 Kure Beach home just steps from the beach!!! Historic Costello Suite - 211 Princess St.